Many human genes have counterparts in distant species such as plants or bacteria. This is because they share a common origin, they were invented a long time ago in a primitive cell. However, there are some genes that do not have counterparts in other species, or only in a few of them. These genes have been born much more recently. Although they may have appeared by accident, some have acquired useful functions and been preserved by natural selection. 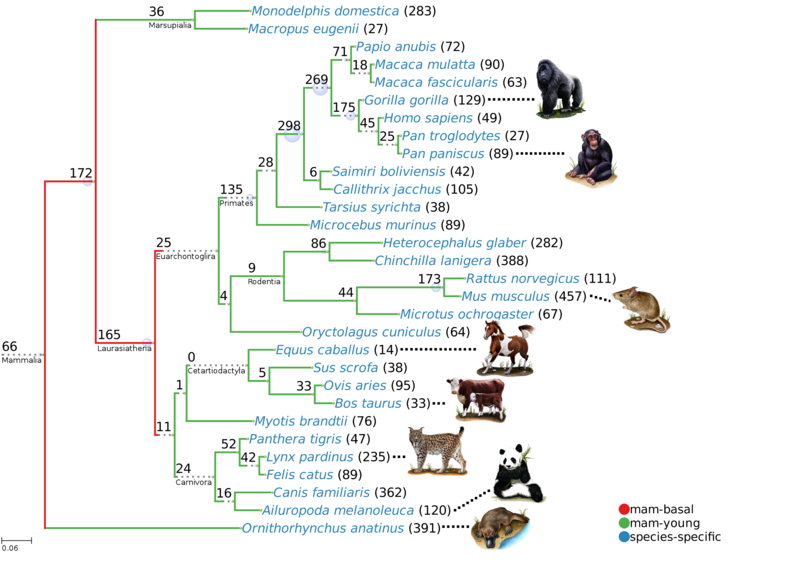 We have recently compiled thousands of mammalian-specific gene families and asked which functions they perform. We have found an enrichment in proteins from the immune system, milk, skin and the germ cells. The most recent genes, however, are rarely functionally characterized. The results of this work provide new insights into how new genes originate and what they are selected for. Read our paper at bioRxiv and tell us what you think! See the final paper publication in Genome Biology and Evolution. News at IMIM here. The numbers in the nodes of the tree indicate the number of gene families identified.